Getting a good night’s sleep doesn’t necessarily stop once you’ve found the right mattress for your needs and sleep preferences. Depending on your health needs or lifestyle preferences, the bed foundation you choose can also make a considerable difference. Adjustable bases are gaining popularity among people of all ages as manufacturers continue to bring innovations to the adjustable base industry and provide consumers with new ways to get enough of a good night’s sleep and relaxation they need. Although adjustable bases have their roots in the medical market, today they are far from their beginnings and they come in modern designs and offer a large number of features. While you may not have considered getting one in the past, their growing popularity and many benefits that they offer might make you reconsider. There are many new online mattress companies that sell a great variety of these adjustable bases and the one we’ll be reviewing today comes from Tempur-Pedic online mattress company. Click here for the lowest price available on a Tempur-Ergo Premier Adjustable Base. Tempur-Pedic is one of the leading manufacturers and distributors of mattresses and pillows made from their proprietary memory foam. Although Tempur was originally based on NASA’s research program aimed at improving crash protection for airplane passengers and developing a material to cushion aircraft seats, provide comfort during long flights and protection in the event of an accident, it managed to develop and create a wide range of sleep products based on that material and today it has such position on the market that is hard to beat. Among quality mattresses and pillows, the company also offers amazing adjustable bases that come with many features such as the Tempur-Ergo Premier Adjustable Base that we’ll be reviewing today. This base is one of the newest motorized bases available online. It offers some of the features that most adjustable bases have such as remote controlled setting, a great balance and whisper-quiet motor, but it also offers some high-tech features that really appealed to us as a couple and that are unlike those offered by other similar adjustable bases. Tempur-Pedic, unlike other companies, don’t share a lot of information about their technology. They consider it proprietary information, so there are not many details about the materials they use for the construction of their mattresses, pillows and adjustable bases. But, what we could see is that the Tempur-Ergo Adjustable Base is made of a Heavy Duty steel frame with an upholstery finish and standard four 6.5″ legs that come with the base but can be replaced with higher 9” or lower 4.5” legs though you have to purchase those legs separately. It also allows the installation of headboard brackets, but a headboard bracket kit is available and sold separately as well, and it has a lift capacity of 650lbs and a powerful but quiet electric motor which allows seamless changing of positions which is especially appealing to those sharing their bed with a partner. The very base is wrapped in one piece of extremely soft, highest-quality polyester cover and is unlike other adjustable beds that have multiple sections, each individually wrapped in their cover. There is also a proprietary Tempur material beneath the cover and around the edges of this base which increases its overall comfort and helps avoid painful bumps when getting in and out of bed. 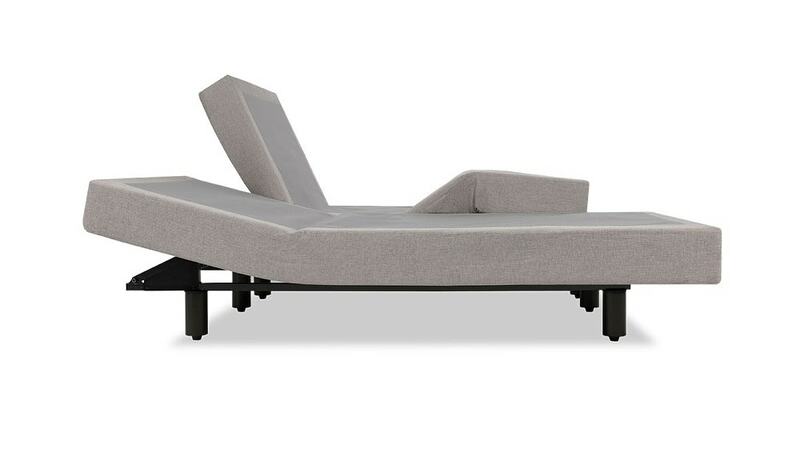 So the Tempur-Ergo Premier Adjustable Base can work perfectly well with the mattress you have at your home, provided it is flexible enough to do a little bit of bending, but usually all the beds that come compressed in a box can fit the adjustable base. Besides this, there is a large metal retainer bar that can be installed at the bottom end of the base which helps keep the mattress in place while adjusting the base. All of the functions of this adjustable base can be accessed and controlled via the wireless TEMPUR-Ergo digital remote that comes with the base. The remote is WiFi enabled, which means that you can control the base from your mobile device with an Apple iOS (4.3+) or Android (2.1+) operating system (you can download these applications for free). There is an LCD screen on a remote as well that shows the users the settings and status of their adjustable base, and its backlight is motion-activated which allows you to easily use the remote even in the dark. In addition, the buttons are simple to understand and have raised numbers and symbols on them so you don’t have to look at the remote when looking for certain functions. The Tempur-Ergo Premier Adjustable Base comes neatly packed in a box. All you need to do to fully set it up is to get it out of the packaging, turn it upside down, attach the motor to the base, plug the cables to the power supply, screw in the legs, turn it over, and plug it into the wall to operate. The base comes with the instruction manual which makes the setup process pretty simple and it took us less than 15 minutes to fully assemble the base. The manual is also available for download on the company’s website. The company offers White Glove delivery service which means that if you don’t want to set up the base by yourself, the delivery men will do that for you. Also, their White Glove service can remove and dispose or donate your existing mattress. The Tempur-Ergo Adjustable Base is available in both split and single options, and they can perfectly fit a great variety of mattress sizes though they are purposefully built to have slightly smaller dimensions than the mattresses they are supposed to support to ensure compatibility with bedroom furniture. If you choose to use a split adjustable base, you should know that there is the Ergo-Link in the form of tie straps that will allow you to control both sides simultaneously. If you use these tie straps properly, they will securely hold split adjustable bases together. This time, we used a single base (Queen size) which worked perfectly well with any mattress we tried with it, and it proved to be a really good choice for us as a couple. We are satisfied with its overall comfort and support and how silently it moved when we wanted to change positions during the night though we were forced to make certain compromises as we couldn’t adjust positions to our liking separately. The base provides excellent support for both the mattress and sleepers above regardless of the position to which it is adjusted. It is quiet and and allows seamless changing of positions. It doesn’t shake when adjusting it to other positions so you won’t feel any disruption in your sleep. The Tempur-Ergo Premier Adjustable Base is a great base that comes with many extraordinary features that will give you a complete control over your rest and sleep. It comes with almost unlimited number of ergonomic rest positions, rejuvenating massage options and a wireless remote that will let you access all functions and fully customize your sleep. It offers several options to lift your head up to 70 degrees and feet up to 37 degrees to create a comfortable position for watching television or reading and relaxing all at the push of a button on your remote, and regardless of the position you choose, you’ll feel amazing comfort and support. Besides this, the adjustable base also comes with massage motors for the lumbar area, the head and the legs which offer several massage programs: standard, wave, synchronized wave, and pulse. Like the elevation, these are controlled by the wireless digital remote. The Tempur-Ergo Premier remote also comes with memory buttons that allow you to store up to 4 preset ergonomic positions. Namely, you can adjust the base to your liking and have the remote remember your favorite positions. This function saves you the trouble of finding your position every time, so you can just leap into the bed and reach the desired position simply by pressing one button. What also makes this adjustable base unique is that it comes with the wall-hugging feature which allows you to place your adjustable bed against the wall and, no matter in what position the bed is, it will always keep the same distance between the top of your mattress and the headboard to avoid scratching the wall. And finally, you can use the Tempur-Ergo Premier Adjustable Base even if the power goes out as the base has backup power with a 9-volt battery. But to lower the base, you don’t need even this since that can be done even if the remote is not working. The Tempur-Ergo Adjustable Base may seem to be a bit pricey with the Queen version coming in at $1599, but this is quite a reasonable price given the quality construction, modern design of this adjustable base and many features that it offers. The company claims that they build every their base to last, so they don’t offer the possibility of returning it for a full return, but the base comes with a 5-year full warranty on parts and labor and a lifetime warranty on the frame itself. Besides this the company offers White Glove delivery service and free delivery with every mattress. Is the Tempur-Ergo Premier Adjustable Base Right for You? Buy the Tempur-Ergo Premier Adjustable Base if you like:. Modern adjustable bases – The Tempur-Ergo Premier Adjustable Base is a modern adjustable base with a beautiful and elegant design and many great features that will give you a complete control over your rest and sleep. It comes with almost unlimited number of ergonomic rest positions, rejuvenating massage options and a digital wireless remote that will let you access all functions and fully customize your sleep. Besides this, the base also comes with programmable memory option and a backup power that you may need when the power goes out. Adjustable base with a wall-hugging feature – What also makes this adjustable base unique is that it comes with the wall-hugging feature which allows you to place your adjustable bed against the wall and, no matter in what position the bed is, it will always keep the same distance between the top of your mattress and the headboard to avoid scratching the wall. This also allows you to save space without losing any performance. Adjustable bases that come with high-tech remote controls – The Tempur-Ergo Premier Adjustable Base comes with the wireless digital remote that doesn’t just give you the access to all the functions of this base, but that is also WiFi enabled, which means that you can control the base from your mobile device with an Apple iOS (4.3+) or Android (2.1+) operating system. There is also an LCD screen on a remote that shows the users the settings and status of their adjustable base, and its backlight is motion-activated so you can easily find the buttons you need in the dark without the need to switch on the lights. Overall, the Tempur-Ergo Premier Adjustable Base is a great adjustable base and we are really satisfied with how well it worked for us. It comes with a modern design and many amazing features that make it truly unique and totally worth its value. It doesn’t only allow you to adjust it to almost unlimited number of ergonomic positions, but it also allows you to save your favorite position and reach it every time you go into a bed simply by pressing one button. In addition the base offers several massage options, a wall-hugging feature and it comes with a digital WiFi enabled wireless remote with and LCD screen and motion-activated backlight. So, if you are looking for a modern, durable and reliable adjustable base that can function either with or without foundations or box springs and that can perfectly work with a great variety of mattresses of different sizes, then you should look no further from the Tempur-Ergo Premier Adjustable Base. It is an option definitely worth considering.